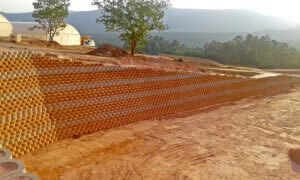 When an independant Swazi egg producer experienced rapid business growth, he found himself in need of additional chicken sheds and consequently, a cost-effective retaining wall solution. Located between pineapple fields and commercial forests in the fertile Malkerns area in Swaziland, the enterprise started from scratch a number of years ago, with only two sheds. Today the farm has been growing with Terraforce and now can successfully compete with imported eggs from South Africa. Local Terraforce block producer and installer, EFS Precast, was called upon to submit their bid for a retaining wall design and installation to stabilise the embankments of the excavated platform. The submitted solution, which proposed the construction of a 750 m² wall – up to 6m high at an inclination of 70 degrees – was accepted. 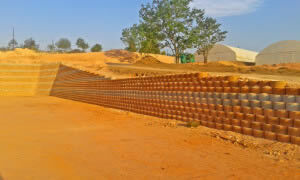 The wall was built – in a more cost-effective way – in long continuous stretches by a team of 8 labourers, assisted by a TLB/front end loader, within 41 work days. Local backfill, compacted with pedestrian rollers and rammers was used, with geotextile reinforcing at specified levels. 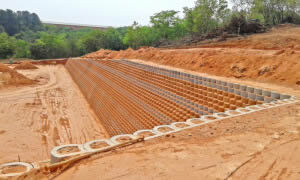 Subsoil drainage, with outlets every 5 m was installed at the cut-face, while an open V drain will still be installed above the wall, draining to both ends of the site. 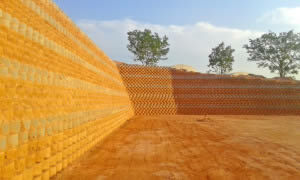 In addition to cost savings, the farmer was also pleased when the installer decided to break the uniform appearance of this sizeable structure by introducing block layers in two alternating colours.To further improve appearance, the client will establish suitable indigenous plants in the soil filled blocks.